To update an employees tax file declaration you need to open the employee file and then click tax file declaration tab on the left menu. Employing entity. Click on "Change" and then select the employing entity from the drop down list that you want to be changed to. 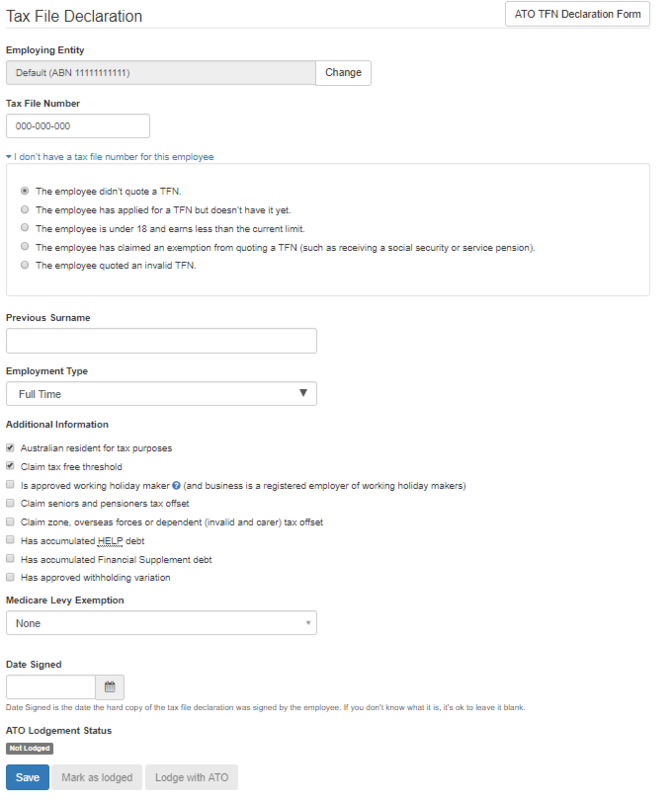 There is also the option to select when to change the employing entity as of e.g. "Today", "Employee's start date", "Custom Date". Employment type (required). Click on the drop down to select. Additional information. Note that the first two boxes Australian Resident For Tax Purposes and Claim Tax Free Threshold are ticked by default. You must untick these if the employee is not an Australian Resident and/or they cannot claim the tax free threshold (second job etc). Whether the other boxes should be ticked or not (seniors offset or HELP debt) will depend on the individual employee and what they have nominated on their tax file declaration form. If an employee is not an Australian resident for tax purposes, they cannot claim the tax free threshold. Only a non-Australian resident can be an approved working holiday maker. For more information on what an approved working holiday maker is, click here. The tax variation field is the rate of tax to be withheld. If the employee has a tax variation that has been approved by the ATO, please check the 'Has approved withholding variation' checkbox and then enter the tax variation amount. This can be specified as 0 for no PAYG to be deducted. The Medicare Levy Exemption allows you to select from 'None', 'Half' or 'Full'. Date signed field is able to be left blank, otherwise input the date that the employee signed the hard copy tax file declaration. 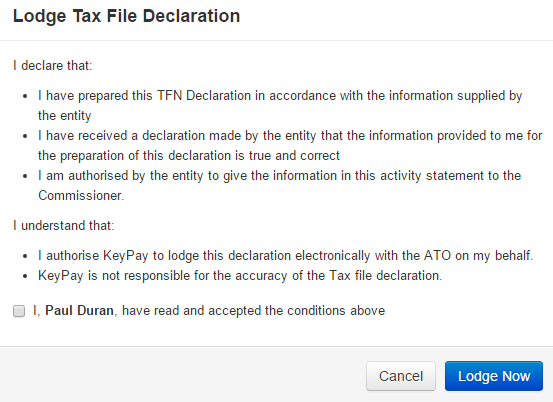 Lodgment Status shows when (and how) the declaration was lodged to the ATO. To re-lodge select 'Clear lodgement' before submitting again. Visit the Australian Tax Office for more information regarding tax file declarations. The ATO is changing the way clients authenticate when using SBR-enabled online software. Read more about Cloud software authentication and authorisation (CAA) from the ATO website. Before lodging the tax file declaration, businesses (and each employing entity) must first register their software ID. 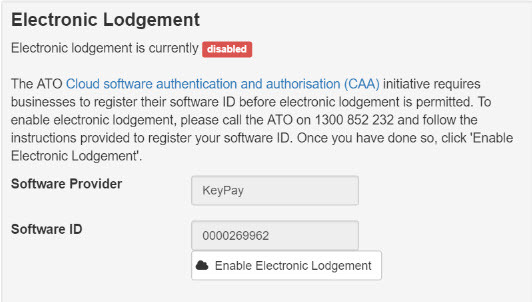 To do this, go to payroll settings -> ATO Supplier Settings and follow the instructions to enable electronic lodgement. You will not be able to lodge a TFD without first completing this process. You may opt to lodge the tax file declaration electronically using Standard Business Reporting (SBR). To do so, click the 'Lodge with ATO' button. Doing so will display a dialog explaining the terms of the declaration. The terms must be accepted before the declaration can be lodged. Once the terms are accepted, click 'Lodge Now' button and the tax file declation will be lodged electronically.